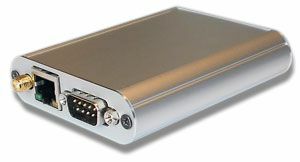 The SerialGhost is a compact RS-232 and serial bus logger packed with features, such as time-stamping, Ethernet, and Wi-Fi. It has a huge memory capacity of 8 GB, and may be accessed as a USB Flash drive. 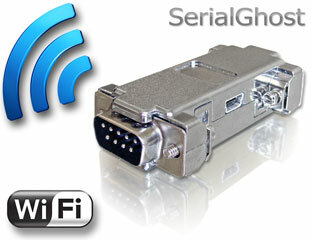 The SerialGhost Wi-Fi contains an embedded Wireless LAN module, enabling it to connect to a Wi-Fi Access Point, send E-mail reports. There is a variety of 8 different versions, covering any serial logging application at a very competitive price! The SerialGhost is a compact asynchronous serial logger, capable of recording RS-232 data streams from devices like printers, terminals, keyboards, mice, barcode scanners etc. 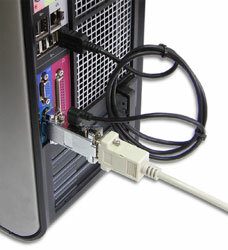 Simply connect the SerialGhost in-line on a serial bus, using the DB-9 connectors. If a USB port is available, you can power the device from USB. 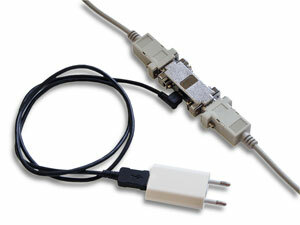 Otherwise, use the supplied cable and connect an external 5V power source (such as a smart-phone charger). The SerialGhost will immediately start logging all data available on the bus, both upstream and downstream (RX and TX). No software or drivers are required. To view the recorded data, the SerialGhost may be switched to Flash Drive mode. 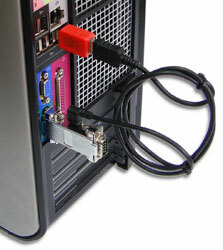 Use the supplied USB key to connect the device to a USB port. A removable Flash drive will pop-up, containing a file with logged data. The log file will be interleaved with time and date-stamps. The Flash drive may also be used to configure the device, such as baudrate, parity bits, start/stop bits, etc. The SerialGhost Pro, SerialGhost Pro Module, SerialGhost Pro Wi-Fi, and SerialGhost Premium all feature a USB Virtual COM interface, meaning they can be accessed by any PC-side software application. The SerialGhost Wi-Fi also incorporates a built-in WLAN transceiver and TCP/IP stack, meaning it can connect to the Internet through a Wi-Fi Access Point. To do that, you must provide it some basic data, such as the Network ID and password (just like any WLAN device). 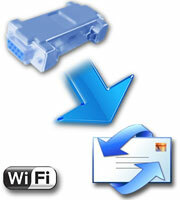 Once connected to an Access Point, the logger will start sending E-mail reports with captured serial data to any recipient E-mail address you supply. The SerialGhost Premium and SerialGhost Wi-Fi also feature a TCP/IP interface, for on-demand access at any time. You can remotely download recorded data from the logger, using special software delivered with the device. The control software can communicate with multiple serial loggers, allowing to create entire networks of wireless loggers. This solution is particularly recommended for monitoring networks of sensors or peripheral devices. If you just need to efficiently monitor a serial (RS-232) peripheral device, the standard SerialGhost is the proper choice (SerialGhost Module for embedded applications). The SerialGhost Pro, SerialGhost Pro Module, SerialGhost Pro Wi-Fi, and SerialGhost Premium all feature a USB Virtual COM interface, meaning they can be accessed by any PC-side software application. If you want all these features, and additionally remotely access the device over Ethernet or Wi-Fi, choose the SerialGhost Premium or SerialGhost (Pro) Wi-Fi.